I don’t want to take the edge off what was ultimately a nice lunch. I really wanted to love Atomic Burgers. As Londoners, we’re generally nonplussed about restaurants outside of the M25. Apart from a few remote Michelin exceptions there’s a general nonplussed ignorance to what else is out there. Atomic have done quite well building their profile and reputation, sticking well away from London and its fastidious and unkind food nerds. Instead, they’ve started in Oxford and moved on to Bristol. We imagine they’ll probably do Brighton next, perhaps followed by Cambridge and Bath so they’ve covered all the Places-It’s-OK-To-Move-To-From-London bases. You can’t help but root for the provinces - we want something worth leaving town for. It sounds prickish but it’s true. With Atomic, I wanted to spend a few hundred words extolling its quaintness and ability to knock out quality burgers worth travelling for, encouraging everyone to jump on a train at Paddington and get over there. Atomic caters for two key groups: students and parents with kids. Most of the students in there were clearly of the Oxford Brooke’s wastrel variety since the actual proper Oxford students just don’t have time to eat out. To make my experience at Atomic all the more authentic, I’m not here with a narky London cohort. Instead we’ve borrowed a family of four for the day, the sort that don’t get to eat out very often. We’ve phoned ahead to make sure we’ve got space for buggies and that they have colouring books. Upon arrival the staff are lovely and accommodating and any potential stress is immediately relieved. Other families give us the ‘thanks for bringing your kids here too so we don’t draw too much attention’ nod and the Polytechnic squadron are all still too hungover to see. The dining room is festooned with 80s kid TV paraphernalia. Superman rubbing shoulders with Boba Fett. Venkman crossing the streams with He-Man. I’m worried though. 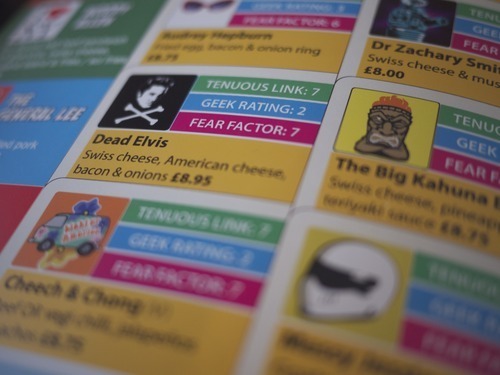 The menu is an enormous comic book of several hundred burger combinations. I settle for something as close to a bacon cheeseburger as I can get. The burgers I’ve seen emerge from the kitchen look floury and drab, hemmed in by a ring of anaemic fries. It arrives and my fears are confirmed. It’s basically awful. GBK-in-2007 awful. A bappy, slimy anticlimax. The bun is huge, floury and supermarkety. 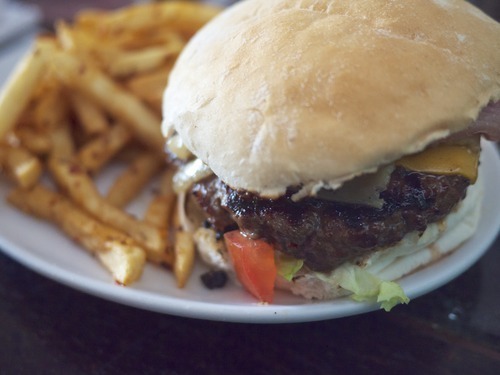 The patty is thin, dry and cooked to a crisp. The salad is wet and pointless. The bacon, oh God the bacon. It had been shown a grill for maybe sixty seconds. Pink, limp and flecked with the white discharge of doom. Everything has been dialled back in the most depressingly English tradition. It is, in fact, the middle England of burgers and I’m trying to eat it without grimacing or swearing because there are children present. So let’s not talk anymore about the food, because the hope of finding one of those out-of-town little gems has been extinguished. No saving graces. Let’s talk, once again, about context. Atomic couldn’t really open in London without changing the product significantly. I doubt they have any intention to. We’d guffaw and laugh. Poke fun at their atrocious bun choice and inability to cook meat appropriately or even melt some cheese. Since they’re independent, we wouldn’t fully unleash the kraken reserved for the knowingly industrialised tripe of Giraffe and its mutant bandwagon-jumping babies. We don’t even bother writing about GBK. But Atomic should be worried, because as much as they’d like to make a little ring fence around London, the Londoners will move out. Byron, with its carefully cultivated service design nous, is rapidly spreading out of town purely because they’ve run out of boroughs to open in. They’re already in Kingston and Kent. I’m sure Tom Byng has been spotted in Oxford and Bath and Bristol and Brighton. Plotting. Looking handsome. Writing things in a little notebook. 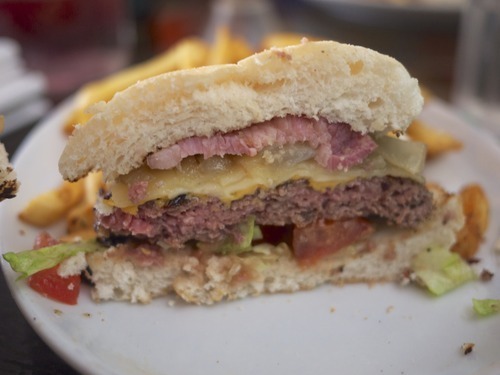 Atomic will be in trouble then because the local populace, much like my dining partners, haven’t really had a ‘proper hamburger’ since that time they were on hols in America. 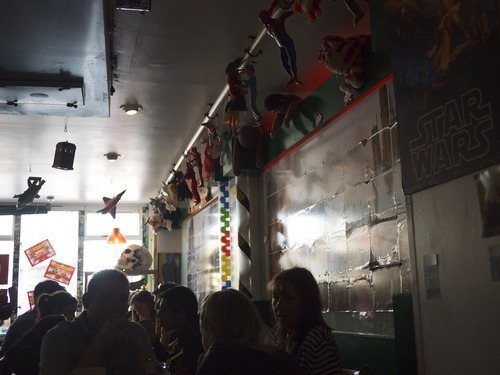 They will then see that the friendly, groovy, well-meaning little restaurant with the 80s toys glued to a shelf was actually churning out a pretty bad product. It will be a sad time for everyone. I don’t want to launch into the diatribe I’ve been rewriting in my head about buns and grinds and the trouble with back bacon in burgers. I don’t want to take the edge off what was ultimately a nice lunch. The kids were entranced by cartoons on the screens. Everyone ate their food. Nobody hurt themselves. The staff were sweet and accommodating. There’s a chance he’s just being polite, since obviously, we chose the venue because I wanted to review it and who knows when I’m going to be anywhere near Oxford again. Maybe his burger had been cooked properly. Maybe I’m getting to the stage where I can’t enjoy a burger just for what it is anymore, instead of deconstructing everything to the point where I’m just being boring. So I keep quiet and nod. A fun place with average food that’s good in the eyes of its local customers. Does that make it bad?